The reboot of the "Planet of the Apes" series continues to surprise. The series turns out enjoyable, thought-provoking stories, told with impressive computer animation and acting. The story began with medical experiments on an ape named Caesar, who develops intelligence, the ability to talk, and the kind of leadership qualities that gave his creators second thoughts. This "Dawn" led to a "Rise" and now a "War," pitting Caesar against Woody Harrelson, who leads a renegade army, determined to wipe out the species. Harrelson's troops kill some of Caesar's family. The once peace-loving primate wants revenge. With the help of loyal friends, including a wise orangutan, a mute human girl, and a new character voiced by Steve Zahn, they track Harrelson to his lair, but their plan goes awry. Caesar is captured and enslaved, along with hundreds of his species. I have a little trouble seeing past Woody Harrelson to his character, a latter day Marlon Brando from "Apocalypse Now." Still, Woody has moments that almost gave me goosebumps. The reference is certainly made on purpose. In one scene, some of the ape prisoners find an escape tunnel where a former inmate has conveniently written "Ape-pocalypse Now." Much of the acting is silent, approaching the grand days of silent cinema. The addition of a mute human girl adds a plot twist. Many humans suffer from an ape-based disease that causes loss of voice and regression, the opposite of the continually evolving apes. 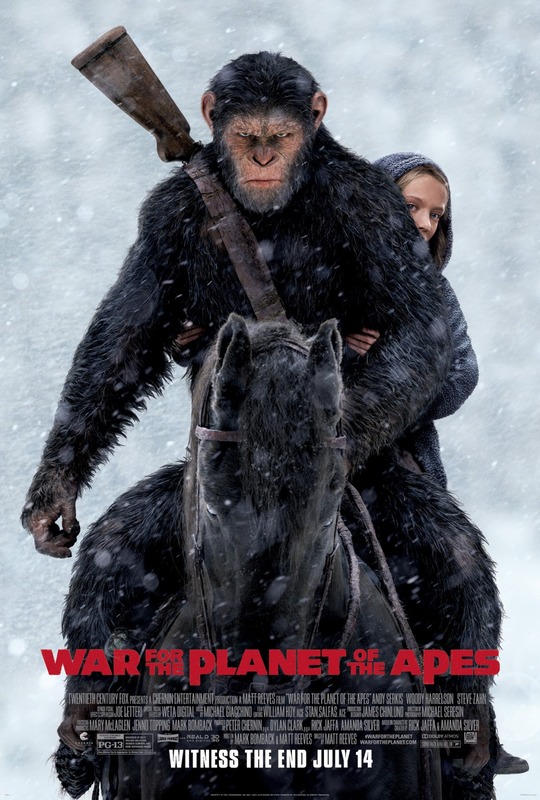 "War for the Planet of the Apes" delivers more than a favorite series reboot: It makes you think. After all, who do you think wins this war? "War for the Planet of the Apes," 3 stars, rated PG-13. Does it deliver what it promises? Fascinating story, told well. Is it entertaining? Better than expected. Is it worth the price of admission? Yes.